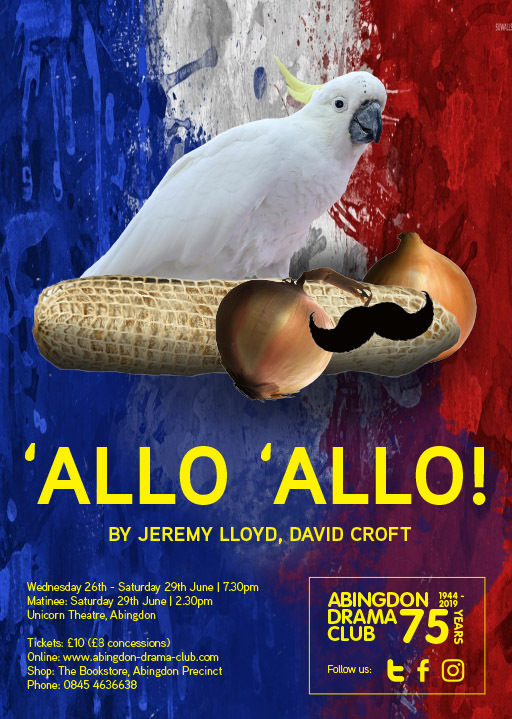 Each year ADC produces three shows at the Unicorn Theatre in Abingdon. An eclectic mix of modern dramas, classics and comedies. Every other year we produce our very popular pantomime. Once you join the club you can take part in every show and activity. You do not need to audition to become a club member. There are castings for every production and every member, new or old, has the same chance of being cast in a leading role. All you need in order to be cast is enthusiasm and commitment. Please get in touch with us if you are interested in getting involved backstage. There are a huge number of different jobs that need to be done in order to get a show onto the stage and lots of them do not involve any acting. ADC is a very friendly club with a family atmosphere. New members soon become part of the family. Theatre takes a lot of time and effort to produce but the rewards are huge. Get in touch to find out more about ADC and about how you could be part of the next show! To get more information about the club and to find out when you can come and meet us, send us an Email: membership@abingdon-drama-club.com. Adult membership is £40 per year. You must be 16 or over to become a full member of ADC. If you are under 16 you can join our fantastic Junior Drama Club. All tickets are sold as unreserved seating. Our Front of House team will do their very best to seat people together but please arrive in good time or this may not be possible. Please get in touch if there are any problems with your booking. An online booking fee of 55p is added to the ticket price. This pays for the Paypal credit card payment system. 1. Select a ticket type - on this page. 4. If you want another type of ticket, click on the 'Continue Shopping' button, return to this page and repeat the process. 5. Purchase your tickets using a credit or debit card - you do not need to have a Paypal account. 6. When you purchase tickets you will receive an email receipt from Paypal, not Abingdon Drama Club. 7. We do not send tickets by post. When you arrive at the theatre, for the performance, all you need to do is to give your name to the box office. We will then give you your tickets. All sessions are run by professional drama teacher Andrea Mardon. Andrea has many years experience teaching children from all over the world. We cater for those interested in all aspects of theatre and performance. A combination of drama games, improvisation and scene work. A fun way to make new friends and start to learn the fundamentals of theatre and performance. SPACES AVAILABLE! This class focuses on building drama skills including voice, movement, action, objective, subtext and characterization. In-depth study of plays and playwrights supports learning, particularly for those enrolled in GCSE Drama. SPACES AVAILABLE! Students who have done 1 or more terms at ADC are welcome to join our Performance Class which works towards a full length show each term to be performed at the Unicorn Theatre. Past shows include Peter Pan, Dracula, The Laramie Project and The Servant of Two Masters. Our teacher Andrea is an actor and director. She also coaches students for LAMDA examinations as well as drama school entrance auditions. She regularly appears onstage in ADC productions. ADC have been providing Junior Drama Classes for the community for over 30 years! To get more information about ADC Juniors send us an Email: enquiries@abingdon-drama-club.com. There are three terms each year. The total cost for a full year of acting training is only £255. All sessions will be paid for irrespective of attendance. In December 1944, during the Second World War, a group of Abingdon people, some from the Guild of Abbey Players, decided to start a new drama group - Abingdon Drama Club (ADC). Our first public production was London Wall by John Van Druten and took place in the Corn Exchange in the Market Place, in September 1945. The first club meetings took place in the Old Carpet Factory, beside the Thames near Abingdon Bridge. In 1946 the club moved to the Friends’ Meeting House, located on the Vineyard opposite the then Row Barge pub. The present ADC clubhouse, in Marcham Road, was acquired by the club in 1960 for the princely sum of £1274.15! The clubhouse contains our rehearsal space, green room, set workshop and store, costume store and props store. It is also the home of our fantastic Juniors section, which has been providing drama education for young people for over 30 years. Our paper archives contain posters and photos from every show we have ever performed but it is the costumes, props and pieces of scenery which have been used across the years that are a remarkable 'living' history of the club. When the Unicorn theatre opened in June 1953, the first production was by Abingdon Drama Club – the 16th century play, The Two Angry Women of Abingdon by Henry Porter and directed by Alan Kitching. Since ADC began we have presented over 270 productions.